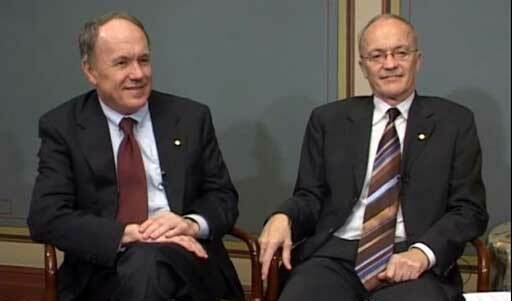 Transcript from an interview with the 2004 Laureates in Economic Sciences, Finn E. Kydland and Edward C. Prescott, on 11 December 2004. Interviewers are Professor Karl-Gustaf Löfgren and Johanna Åström, post graduate student, Umeå University. Edward Prescott and Finn Kydland during the interview. We have the pleasure of welcoming the 2004 winners of the Bank of Sweden Prize in Economic Sciences in memory of Alfred Nobel. The winners are Professor Finn Kydland from Carnegie-Mellon University, Pittsburgh; and Professor Ed Prescott from Arizona State University, Tempe, Arizona. Professor Kydland also holds a position at the University of California, Santa Barbara and Professor Prescott is affiliated with the Federal Reserve Bank of Minneapolis, Minnesota. I am Karl-Gustaf Lofgren, a professor of economics at the Umea University and next to me is Johanna Åström who is a grad student at Umea University. And please Johanna, you can start our conversation. So how did all start? Why did you decide to become economists? Was it just a coincidence or was it something that you had planned for a long time? Finn E Kydland: I certainly didn’t plan for it when I was almost through with high school, I had done pretty well in mathematics and I thought I would become an engineer. But then through various coincidences I ended up studying at the business school, Norges Handelshøyskole, and still then I didn’t think I would become an economist. I assumed this was an education that would lead up to a management position somewhere, maybe become a director of some company. And I just happened to take an advanced seminar from a very exciting professor, Sten Thore, exciting and excitable. He had us read very interesting and advanced papers in management science, operations research and I wrote my first FORTRAN programme using dynamic programming. Then just before I was done, he came and asked me to become his research assistant and I followed him to Carnegie Mellon where he went on leave for a year and decided I had to get a piece too to make it in this field. So I never applied anywhere other than Carnegie Mellon. And then that was another great fortune because Carnegie Mellon has such a great research training programme, rather than doing all kinds of courses they get you started on doing papers right away. And so I did a first year and second year research paper and got them both published, and that’s a great start. Certainly. And you Professor Prescott, how did you start? Edward C Prescott: Tend to be drifting in, into that field. When I went to college it was the Sputnik era, so everybody wanted to go into physics. I was in that programme at Swarthmore College and was in the honours programme in my junior year and I decided I didn’t like laboratories. I didn’t like sitting in there all day being very careful and meticulous. And so I said, Well, I’ll major in math. I did have a very good special teacher, one course and sort of engineering economics or engineering science, tied to management, Sam Carpenter. And so I went to get a degree in operations research, which was a new field of applying mathematical tools and modelling tools to management problems. And then I went to Carnegie Mellon, it was Carnegie Tech then. It’s a multi-disciplinary programme, a minimal number of course requirements. I don’t know if they had any course requirements, but you had to take a certain number of exams in different areas. But then I got attracted to the people in Economics because it seemed to be where the action was. Bob Lucas came as an assistant professor the same year I came as a graduate student. It must’ve been a very interesting period there at Carnegie Mellon at the end of the 60’s. Edward C Prescott: Yes. Actually I was thinking about going into artificial intelligence because that was an exciting field there, too. And took some of Alan Newell and Herb Simon’s courses in that field. So then I ended up in economics. I know of course that you were Finn’s advisor, but I’m really very curious about this time inconsistency, or consistency result, however you like to put it. How did you start with this in the first place? I know you produced the thing in Bergen in 1975, but I guess you had some idea, why you just picked this problem and you got together in Bergen in ‘75? Edward C Prescott: There was a change. We recognised that thinking in terms of using these old system of equation models, waiting to say What should you do now? was not a question in the language of economics. But you could evaluate rules. So the obvious question is what’s the best rule? And so we set out to find that. And the finding was that there was no best rule because you’re dealing with people who anticipate and think. Initially we were a little disappointed because we didn’t find what we were searching for, but then we thought, this is a neat result. Finn E Kydland: And then I had already encountered the time inconsistency issue in my thesis. I had looked around for a thesis topic, at that time the people were worried about something called the assignment problem and it had to do with does monetary policy and fiscal policy, what do they target? But there seemed to be no coherence to that literature in my opinion and so I decided to formulate the problem as a dynamic game between monetary and fiscal policy makers, because of the way decisions are made it seemed that the fiscal policy maker would be, what I would call, the dumber player. And right away it was a model in which the optimal policy for the fiscal policy maker was time inconsistent. In the long run I didn’t regard that particular application as that interesting. I dabbled around also with oligopoly theory with a dominant player, there’s literature on dominant player industries. And again the issue was very much prominent. The dominant player’s optimal plan was not time consistent. But it became a much more interesting issue once we thought about having the government as a whole as the dominant player, sort of playing against the rest of the economy. And there were followers. It was not without challenges because once you do so and you want to do it right, you want to make sure that you don’t treat the rest of the economy as one player, they’ve got to be viewed as atomistic, so we struggled for a little bit with that issue, but it became a methodology that was very useful both for that particular paper and what was to come later. When you submitted the paper did you then, at that time, know that this is really a discovery? Finn E Kydland: I was pretty sure it was an interesting discovery. We had written the first draft of the paper. I’d gone back to Norway and I arranged for Ed to come and visit for a year and we wrote that paper. And then I decided to talk about it at a conference in Cambridge, Massachusetts, in May of 1975. And this was a conference with quite prominent people in the field of economics and control theory, which was quite popular in those days. It’s true the title was kind of inflammatory, initially it was something about the inapplicability of control theory to policy making. So maybe that set them off. But anyway, everyone in the audience thought the result was wrong and a huge discussion ensued and I of course knew I was correct. But the fact that problem people such as Dan Fisher, Gregory Chow and others, David Kendrick, thought it was wrong, that just made it clear this had to be pretty big. How important do you think that your time consistency result has been for the subsequent central bank reforms? Edward C Prescott: Not sure, but they always use it as justification. And if we help in a little way bringing about these reforms, we’re proud of what we’ve contributed. They have moved in that direction and really what the people say, including the head of the Bank of England for example and /- – -/, at the Central Bank here in Sweden, I never heard Greenspan say anything specific about it but many people on the board of governors articulate these views strongly and push in this direction of a good rule and along with the independents, then you can follow it. Finn E Kydland: I have done a little travelling in South America and to me, I’ve seen the contrast between countries in which they haven’t worried too much yet about following your rule or trying to make policy credible, and one sees how much a nation can be hurt by not doing so. And so that’s very depressing. Now exactly what to do about the ones you have lost your credibility, it’s not so easy. But at the same time it provides a contrast where I guess we are quite convinced that in nations where they use transparent polices where one has a good idea about what’s going to happen in the next 5 or 10 years, those nations will be much better off. And if this theory has served to lay the foundation for making them convinced of that, that’s rather better. The second part of your prize concerns business cycle theory. How do you think that this branch of economics has developed since your pioneering article? Edward C Prescott: I think in the pioneering article we developed a methodology. I’d look at what was done just a couple of years before, a statement from, for example, Lucas and Sergeant, who were attuned to the modern dynamic economic theory with the rational expectations. Just bringing that macro with the growth things just clicked and in the way we sort of matched things up with the national accounts and the growth facts and looking at the same set of statistics. And in the process a huge amount has been learned and there’s a multitude of studies within the framework. We happened to focus jointly on the consequences of total factor productivity shocks, but Finn and others have focused on monetary factors, bringing them into that same analytic framework using it in the same tools and techniques. And in the process there’s discipline, theory tells you the answer. You have guesses, you have conjectures, and sometimes they’re right, sometimes they’re wrong. You don’t know until you quantitatively, it’s a big word, quantitatively, work things out. And we developed a way to do that. I think that was a key contribution. Finn E Kydland: Yes, initially of course the theory was relatively simple, although we put in a few bells and whistles that we thought could be important for other business cycle questions we were studying. Since then economists have made great progress in expanding the set of questions you can ask. For example we made the assumption for attract ability and it turned out there was an assumption that didn’t matter for the answer that everyone is alike and is immortal. Since then computing capability has expanded, knowledge of theories, the theoretical framework has been expanded so that it’s easy to bring to bear what we know about life cycle behaviour, for questions where we know that’s important. And they seem to go about these studies and using the same methodology. It’s just that the framework has been expanded. Swedes have a problem now, we have only two Laureates in Economics. We have three in Norway in now and well, today we can’t do very much about that. But I would like to know, did you know Frisch or Haavelmo, have they inspired you or have you heard them lecture? Finn E Kydland: I once heard Frisch lecture. When I was an undergraduate at the Norwegian School of Economics and Business Administration, Frisch came to give a guest lecture and I and a lot of the undergraduates went to hear him. The auditorium A, as it was called, was filled to capacity and I still remember Frisch coming in, in a dark blue suit and jogging shoes. And he sounded very excited about what he did. But I have to admit that at that time I didn’t know much about what he was famous for. Since then I have read some of his works, I was especially impressed by his paper in the castle volume. It’s a beautiful precursor of what was to come and I suspect that people had followed his lead more than some of the others in the ‘30’s. The development of macroeconomics would not have taken as long as it did. And also, of course, Frisch was instrumental in starting the Econometric Society and he was the editor for 25 years, and that became probably the most prominent society in Economics. Haavelmo, I didn’t know quite as well and I have to admit that what he got the prize for is sort of further removed from what I do. Although I have written other things by him, his work on development theory and investment theory is quite impressive. But I don’t believe I ever met him. But I would like to point out that I think Norwegians are proud of the per capita number of Nobel Prizes in Economics. We now have one per 1,5 million people and that would be hard to beat. term. But that’s just out of frustration that he wanted economists to be able to do so much more than they were able to do then. But now we can. So when do you think the first woman will receive the prize in memory of Alfred Nobel? Edward C Prescott: Could be any year. I really can’t say who my candidate is. I can think of a couple of others in the pipeline that are 10 or 15 years away. But it could be anytime. There’s one that could’ve gotten it, but then she became a little bit extreme Maoist, but she had done some important economic research on the monopolists in competition many years before, Joan Robinson. I suspect if she didn’t have the, I think the Nobel Prize committee may have been a little bit nervous about the political thing, not the gender thing. They would love to. Finn E Kydland: It is gratifying to see so many women coming into the field and in some nations more than others. When I’ve been to Spain, Italy and so on, it seems that the proportion has gone up to about 50%. And one has to remember that what you tend to get the prize for still is work you did 20 or 25 years ago, as was the case for us. And so if this is a recent trend then that by itself will delay the process. But it’s going to happen pretty soon. So what kind of research do you do today? Has your interest shifted over the years? Edward C Prescott: Methodology, no. Topic, yes. One thing I was quite excited about is this research with Ellen McGrattan on the stock market valuation. The business cycle model says what the value of the stock market should be and, you know, I had to a few things, put in a corporates sector, you have to build in the tax system, because it turns out to be important and also a regulatory constraint. And the theory just does spectacularly well. But that sort of shifted the more interest in the bigger movements. Prosperities and depressions, these large movements in relative levels. Then I’ll be coming back to this problem about why isn’t the whole world rich type things? And it seems to be barriers to riches. All the groups of people, no matter what nation they live in, if they can set up a good system, they’re rich. They become rich very quickly. But it’s related to the time inconsistency, it’s easier said than done, in what sort of institutions that might be set up that mitigates the creations of these barriers to efficient production. If you look at across countries, you can determine living standards just by knowing how much output is produced per hour worked. The amount of hours worked per person doesn’t vary that much, but the amount produced per hour can vary by a factor of 25 between the rich and the poor. And the relative productivity can change pretty fast, as we know from the growth miracles in Asia. And there were some growth miracles in Europe too after the World War II. The Italians, the German recovery. Finn E Kydland: I might mention two things. One is there has been this belief that monetary policy affects the real economy and I was pondering how can it be there are so many people believe that out there and that it’s so hard to find a good propagation mechanism as Frisch would have called it. And so I’ve been searching to see if a few factors could be quantitatively important. One is working through the interaction with the fiscal tax system, for example if they’re non-indexed, which was the case in the US in the ‘60’s and the ‘70’s especially, but then the tax system changed somewhat in the last 20 years. And low and behold, it turned out that you can get some quantitative effects before the early ‘80’s. It’s interesting that the investment in durables usually bought with loans, the cyclical behaviour is different depending on whether the nation has for some reason or other fixed normal interest rate loans as opposed to flexible interest rate loans. And that may lead one to wonder whether monetary policy or monetary shocks may have had an effect. But in the vein of what Ed talked about, what I found, Ed has studied the world as a whole and compared wealth and incomes all over the world. For various reasons I got interested in particular countries, and so I already mentioned Argentina which I have studied intensively and it’s fascinating but also depressing to study a country that used to be one of the richest nations in the world, and now has a population that is by usual classifications, it contains 40 or 50% who are poor. And why is that and what can be learnt for other nations? Then we have the contrast with Ireland, which used to be poor, and now has become one of the richest nations in the world. So I think one can learn by choosing particular countries to study. Professor Prescott, I’ve heard that one of your sons has a PhD in Economics. What kind of advice did you give him during his education? Edward C Prescott: Zero (laugh). Edward C Prescott: That is true. He was surprised when he saw my papers on the reading list at Chicago. Do you have sons too? Did you give them any advice? Finn E Kydland: Zero (laugh). You have worked a little against the mainstream. You talked about this conference in Cambridge. And they thought it was wrong and they got irritated by your business cycle results. But would you give a person advice to really lean against the mainstream or would you give them any other advice? Finn E Kydland: Yes certainly. You’ve got to do what you believe is going to lead to scientific progress. And we believed strongly that this was the way to go. But if the framework already is a reasonable one for the questions you want to address, there’s not much point in trying to lean against it just for the purpose of leaning. Edward C Prescott: We listen to criticism and if some unfortunate criticism comes up, we fess up to it. I’ve heard that you are a big football enthusiast, so if you had to choose Norway winning the world championships or you winning the Nobel Prize, what will you choose? Finn E Kydland: That question is too easy. I wish I would choose the Nobel Prize, but a Norwegian journalist just after the prize was announced asked a harder question, if you could choose to be who you are and win the Nobel Prize, or be a world famous soccer player? Then, and that’s a much harder question (laugh). So if I could be Martin Palermo or Tore Andre Flo or someone like that, that will make it hard (laugh). I guess that you, Professor Prescott, have been interested in soccer? Edward C Prescott: Yes I got involved in soccer. Soccer was not played much when I was younger, but it’s become a big time sport in the US. I guess I got drafted into that organisation, to coach a team at something and stuck with them. They’re just a great group of kids. I used to make some of my graduate students help me referee or coach, we paid them. I made my sons help out the coach. It’s hard when you want to get the people to do this and the team that I manage was just the greatest group of kids and really talented athletic-wise. And so they can play with the best clubs in the world, including ones from Sweden, and Norway. We hosted a team from Norway, they have the biggest youth tournament over there in Minneapolis in the world. Sweden has big ones too I understand. Dear Professors Kydland and Prescott, on behalf of the Nobel Foundation, I want to thank you for participating in this interview. Thank you very much.